Stav Barkai, right, with the Kling family. They created a web of friendships this past year while Stav was in Cincinnati (missing: Liat Falah). 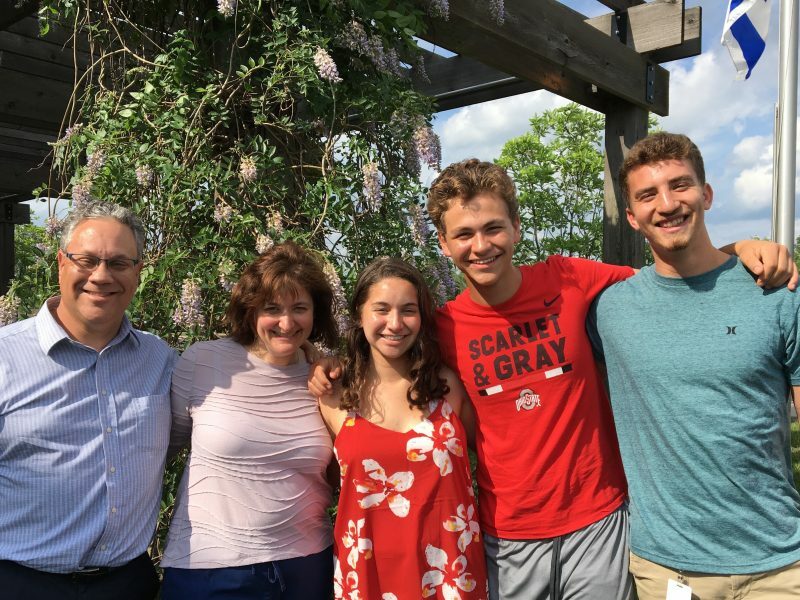 “Nice family, warm hearts.” That’s how Stav Barkai, an Israeli 19-year-old in Cincinnati for a year of service, described the Klings. who live in Montgomery and are members at Adath Israel Congregation. Stav and his partner from Israel, Liat Falah, are volunteers for the Jewish Federation of Cincinnati through August, teaching children, teens, and adults about Israel. 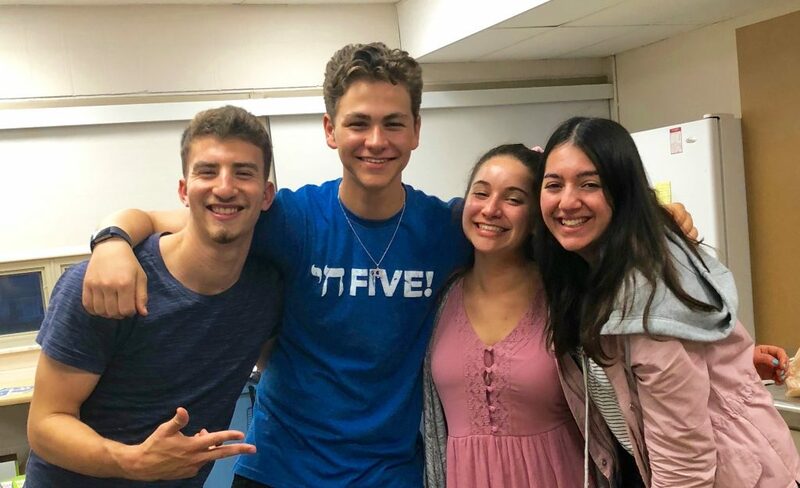 Through their program, known as Chaverim M’Israel, or Friends from Israel, which is a part of the Federation’s Partnership2Gether initiative, they will have taught over 5,000 Cincinnatians about Israel this year. This fall they will return to start their service in the Israel Defense Forces. I met Stav, Liat, and the Kling family—mother Lynn, father Joel, and teens Shayna and Adam—to discuss their new friendships. Danielle: Stav, at age 19 you are on the Israeli National Orienteering Team and have been to two European championships. But you’d never been to the US. What was it like? Stav: —Aaron Rodgers, exactly! And he talked to me and gave me his number and we talked after the class. And I said, this guy is really nice. I knew that—I have one friend—and that’s amazing. And I met Shayna a few weeks afterwards. We made connection and I learned from them a lot, and saw how welcoming are them. The Kling family gave me a lot. They really opened their house for me and Liat. Shayna: I loved having a new set of friends to share different Jewish experiences with. I know that next time I go to Israel I’ll have a new set of family so that’s a really awesome thing. Stav, Adam, Shayna, and Liat became great friends “in three hours,” says Shayna. Danielle: How has the Kling family been affected by the chaverim? Joel: Look at the Jewish Student Union that Shayna is a part of and Adam is a part of at Sycamore, along with USY and BBYO. What I’ve seen this year is Stav and Liat come in, and I see our kids excited to go to those events. And obviously as Jewish parents we want to make sure our kids do things involved with the religion. Shayna: I would agree with that. I think Stav and Liat make events more fun. I’m the president of the Jewish Student Union, and we would ask them to come and everyone would be so excited. Also it just solidifies the fact in my mind that Israelis are more friendly than Americans. We met Stav and Liat one day in August or September, and the next week at Mercaz we were already chatting it up and laughing. Lynn: I think it brings Israel closer, and makes it not so religious, per se. It’s made it more on a more intimate, social level, vs something that you learn about on a map or on tv. Danielle: How is your Judaism similar or different from each other’s? Stav: I didn’t know a lot about American Jewry before I came. I came and I saw so much of how Jewish pluralism works over here, and it does not work in Israel. In Israel it’s either that you are Orthodox, or secular. It’s not really the middle of Reform, or Conservative, or many other streams that we don’t have in Israel. So that’s a big difference. Shayna: I would agree. I went to Israel last summer, and I feel like in Israel it’s more just ingrained. Like they have Purim, and the whole entire country celebrates, and with Yom Ha’atzmaut, the entire country gets the day off and goes crazy. But here you have to put time aside to celebrate. Adam: So I’ve never been to Israel, I’m going next summer, but Shayna always talks about how amazing it was. And you can imagine that, and you can see pictures, or see it on the news or read about it, but it never really means anything until it’s actually in front of you. Stav and Liat have brought that, and it makes me very excited to go to Israel next summer. Joel: One thing that I recall—we were talking: what are you going to do when you go back? For me, having a soon-to-be senior with Shayna going to college the next year, that’s what was on my mind. Then Stav made a quick comment and I remembered: army, got it. It was kind of an “aha” moment for me: while we’re enjoying fun together, there are differences in how our kids grow up and what their path is immediately out of high school. Shayna: —and I turned to one of my friends, and I said, if we were in Israel right now everyone would stand up—which is crazy. Danielle: So did this year strengthen you in a Jewish way? Adam: I think so. At our Shabbat service, when you’re sitting together, your arms around each other, and you hear them singing a Shabbat song that you’ve heard your whole life, and you see them singing it, knowing that they’re Jewish, it brings everything together, it’s just a really cool thing to see. Shayna: I don’t think the Jewish factor is insanely at the forefront. It’s who they are, and just the Israeli welcoming nature. We were all best friends in literally three hours. Danielle: So was it Stav and Liat that led your family to agree to host a young Israeli in the same program next year? Shayna: —I’m obsessed with everything that’s foreign [laughter]. I just want to travel everywhere. And bringing someone from Israel into our home is kind of like bringing a chunk of traveling into our house. And adding a new sister will make the experience even more incredible. Joel: We both have been very philanthropic and involved. I look at this as another opportunity to say yes. That’s important, because it teaches them: it’s good to give back, and do something for the community. Liat: The Klings are a great family and the kids are both good friends of ours. They really show us the city and teached us how it is to be a Jewish teen over here in America. We had a lot of fun with them. Stav: We had an incredible year. I didn’t imagine that my year would be so intense in a good way, we had so many high moments. I always say that the thing that will go most with me to Israel is the connections I made over here. And the Klings are a big part of this for me. Great story. Good form Kling family.